Ever wonder about the accuracy of your canopy VO2 measurements? CMC produces a precise simulated Resting Metabolic Rate, a known VO2 & VCO2, therefore a known REE (RMR, BMR) at a known RQ and verifies overall system accuracy, including software to verify the accuracy of any Canopy VO2 system! A gas containing 21% CO2, bal N2 results in a known VO2 and VCO2 with an RQ of 1. A 17% CO2, balance N2 gas mixture results in a known VO2 and VCO2 with an RQ of 0.773. 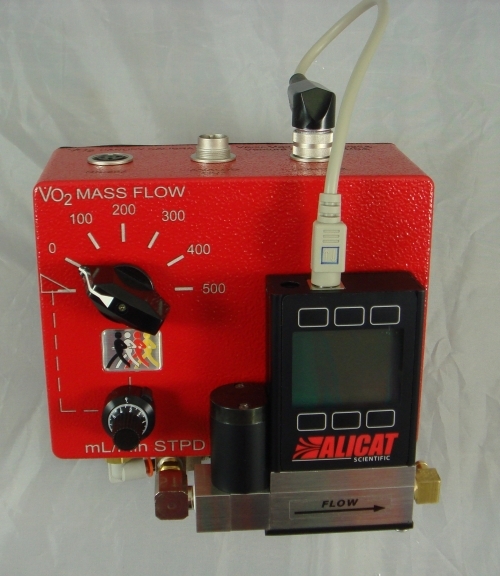 Perfect for systems such as "DeltaTrac" or any other VO2 measurement system utilizing a canopy (hood). The CMC has fixed VO2 settings at 100, 200, 300, 400 and 500 milli-liter per minute VO2 and VCO2 plus a continously variable adjustment to 1 liter of VO2. You simply place the metabolic gas mixture delivery tube under the canopy while running a simulated patient test. Then note the results from your metabolic measurement system and enter the data into the included Excel spreadsheet software template to correct for temperature, barometric pressure and humidity. Our software automatically computes the error. Other preset metabolic rates available. Fool-proof! Totally preset, no adjustments, no calibration. Just open the gas valve and place the gas delivery tube under the canopy (hood). Start a test exactly as if you were testing a patient. Works on the principle of mass preservation, a fact of physics, as sure as gravity. A 5-day rental is now available, total cost including metabolic calibration gas and freight charges $699.00, order # 17055-R and 16921.